The springs were firstly noticed by people from neighbouring villages in the early 1800s. The springs were a kind of reed-bed until 1917. By change a shepherd who was wounded on his foot sees his wound healed by the water of the spring. this fact gets the attention of the public and primitive pools were built. Later on, around 1950's very simple buildings were constructed. In 1960's very springs were taken over by the local administration of Sivas and several lodging facilities were built. Kangal Fish Springs is of a particular place amongst the other thermal baths found with in our country. This thermal, unique in the world is famous for curing the disease world psoriasis. The miraculous way of treatment by the fish which are in the thermal waters 36-37°C increases its fame, since this thermal is the last sort of hope for skin diseases which up-to-date science of medicine can not cure today. Skin diseases such as acne, eczema and psoriases are cured by Cyprinion macrostomus (fish) 2-10 cm in length and by Garra rufa. Those having treatment in the thermal baths for the first time will be surprised when they notice that the brown , grey and beige coluured fish surround them and begin to clear up the spots on the skin. For patients to be fully accustomed in takes 2-3 days. The fish actually nibble on the area of skin affected and migth cause little pain at first, but then this feeling subsides. For the best results it is reecommended that patients spend a total of 8 hours a day in these pools. It is also necessary to drink plenty of thermal spring water on an empty stomach (daily 1,5 lt). This type of teratment has no side effects and medication should not be taken during treatment. The water has been reported as being beneficial in rheumatic disease, neurologic disorders (neuralgia, neuritis, paralysis), orthopaedic and traumatological sequelae (fractures, joint trauma, and muscle disease), gynaecological problems (by lavage), skin diseases, urolithiasis (by drinking), and psychosomatic disorders (a report from the Clinic and Institute of Physical Therapy and Hydrology, Faculty of Medicine Ankara University, March 2, 1967. 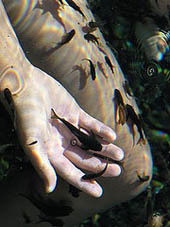 Wide interest in the doctor fish encourages people with neurological and rheumatic diseases to visit the hotspring to immerse themselves in its pools. 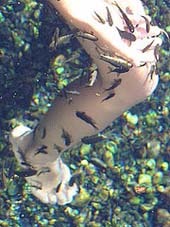 A school of fish surround the body and strike and lick it. The initial pleasant sensation and relaxation of “micro-massage” is replaced by a tingling sensation over the skin. This massage is given particularly by the younger fish, which need many more nutrients for their rapid growth. The Thermal contain hotel facilities in 4 buildings. It is present 137 rooms (134 normal, 3 suit). The springs have 300 bed in 2 motels and one hotel. A suitable area for 50 tents for camping tourism. There are 16 special bath. In winter there is a tube way between bath and hotel. The springs contain 5 pools one being in half olympic size. All seasons open. There is a TV room, a restaurant (200 person), a market (food, vegetable, fruit, newspaper, cigarette, drink), a coffee shop and a playground for children.